UPDATED: Sat., April 15, 2017, 5:10 p.m.
OUTCOLORED – White meat or dark? That might be the first question that comes to mind when you spot a white wild turkey. A white-colored aberration – known as a “smoke-phase” – is rare in the percentages but common in the sense that area hunters and wildlife watchers report seeing a few every year. Local hunter Ivan Lines bagged a gobbler in 2015 with the snow-white plumage of a swan except for the tom’s black beard. Hunters like the simple “smoke-phase.” It occurs in many creatures from robins to moose. Smoke-phase birds and critters that live to adulthood must beat the higher odds against survival as youngsters because of their reduced camouflage protection from predators. 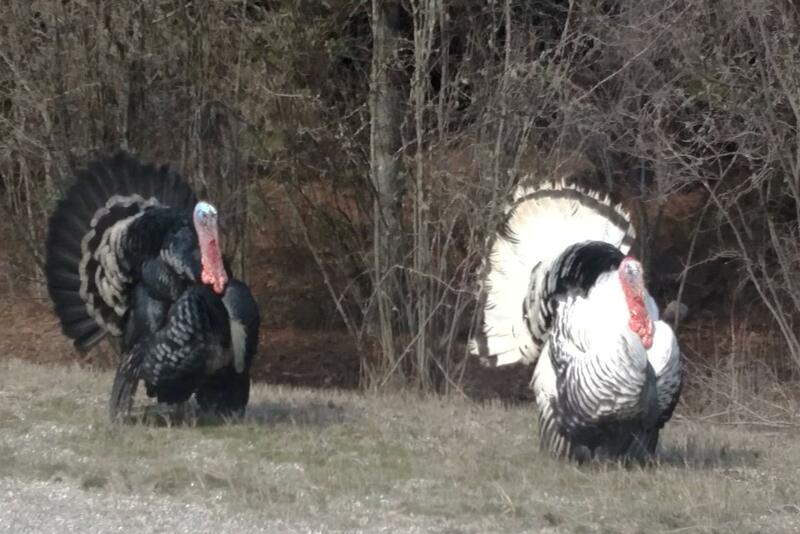 Turkey experts in Minnesota and Michigan have said the smoke-phase is a natural occurrence in wild turkeys that’s not associated to interbreeding with domestic turkeys. Some experts estimate that roughly one in 100 wild turkeys is white or mostly white-colored. They all agree that hens make up a much higher percentage of white turkeys than toms. That means a full-strutting adult smoke-phase gobbler is quite rare. Tom Glines, Minnesota’s senior regional director for the National Wild Turkey Federation, said the wild turkey has four distinct color variations from what is considered the usual plumage – smoke phase, erythritic or red phase, melanistic or black phase, and true albinos, which are pure white with pink eyes. Although these color variations are uncommon, the Minneapolis Star-Tribune reports, the smoke phase is the most frequently seen. Recessive genes or mutations account for the color abnormalities. As for the wild turkey meat, The Spokesman-Review Outdoors Department can tell you from personal experience that it looks and tastes the same – lighter on the breast and darker on the drumsticks – regardless of the plumage color. Published: April 15, 2017, 5:04 p.m. Updated: April 15, 2017, 5:10 p.m.